First Class Dancer in China ; Choreographer, Dance Teacher. Jing Fu is a national first class actress and young professional dancer in China. She was the leading dancer in the HangZhou Song and Dance Ensemble as well as the choreographer and rehearsal director. She has more than 18 years of performance experience and had won many awards in various dance competitions. 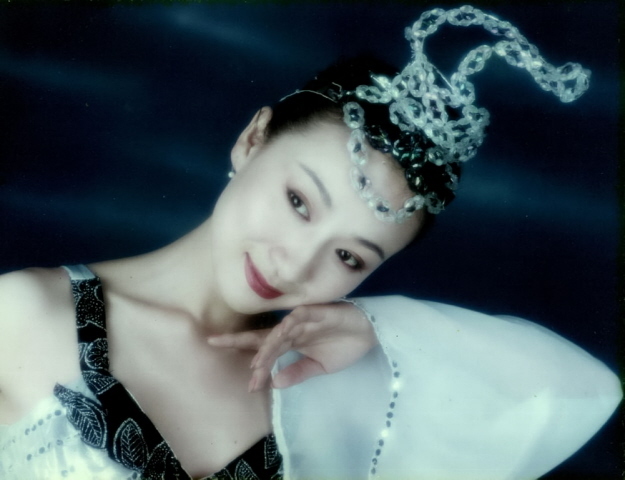 Her personal dance exhibition was successfully held in 1996, and critics honored her to be “the Artist of the 21 Century.” Her solo dance “Paper Cutting Lady” won 2nd place in Chinese National Dance Contest in 1998, and she was invited by the Department of Culture to perform the dance for two consecutive years in 1998 & 1999 at Chinese New Year Celebration Gala in China. Graduate of Shanghai Theatre Academy. Major in Chinese folk dance; Principal dancer in Shanghai Opera House; Licensed teacher of dance grading of Beijing Dance Academy. Molly Chen has won many First Place awards in China since her childhood. She has participated in many international cultural exchange program in USA, Japan, Korea and other countries in past years as well as many dance performances in Shanghai and other cities in China. Molly Chen was very interesting in dance choreography in college, and specialized in it ever since she graduated from college. She has participated in choreography and production of many famous dances both in China and USA in past years. Graduated from Liaoning Ballet Academy, majored in ballet performance and teaching; minored in modern dance, jazz dance and foreign folk dance. Mr. Dou was a demi soloist in LiaoNing Ballet, China and Ballet San Jose, USA; a soloist for the Suzhou Ballet Theater, China and San Diego Ballet, USA. He was trained by many international ballet experts of United States, Russia, France and Demark after his graduation. He played many roles was awarded as a national “Two Stars” Ballet Dancer and a silver medal in the Fifth China Taoli Cup Dance Competition. He has been teaching at J&H since 2012. Sweft is very well known in the dance community of Houston! He has trained since 2003 in modern and jazz at Houston Community College where he earned his Associates in Arts! Sweft also progressed in reggae, salsa, meringue, ballroom, Polynesian, African and specialized in hip-pop fusion. He has danced with the Houston Community College repertory dance company and in 2008 started the school’s first performance team, the HCC Power Eagles, which he was the recipient of the first Power Eagle Award for the team.. Sweft has choreographed for music videos for major artist and theatrical productions across the city of Houston. He also owns a dance entertainment company titled Sweft Feet Dance! The most important things to Sweft are sharing his artistic energies with his students and the world! Principal dancer of Houston Ballet. Chun Wai Chan was born in Guang-Dong, China and received his professional dance training under Guang-Zhou Art School from 2004 to 2010. His honorary awards include 1st place in the 2006 CSTD International Ballet Competition in Australia; Finalist in the 2007 Beijing International Competition; 2nd place in the 2009 National Ballet Competition “Tao Li Cup” in China; Finalist in the 2010 Prix de Lausanne and received full scholarship to study with Houston Ballet’s second company(HBII). While attending HBII in 2011, he was awarded “Houston Ballet Academy Award”. Mr. Chan joined Houston Ballet as a corps de ballet in 2012 and promoted to principal 2017. His repertoire includes the Nutcracker Prince in Ben Stevenson’s The Nutcracker; Mazurka boy in Ètudes; Lucentio and Hortensio in John Cranko’s The Taming of the Shrew; the Bluebird in The Sleeping Beauty; Aminta in Sylvia; the lead male in Paquita; Emerald in David Bintley’s Aladdin; Prince Siegfried in Swan Lake. Leading roles that Mr. Chan has accomplished include Tapestry, Clear and Sons de L'âme by Stanton Welch; ONE/End/ONE by Jorma Elo; In the middle, Somewhat elevated by William Forsythe; The Four Temperament by George Balanchine; Petite Mort, Wings of Wax, Sinfoniettaand Svadebka by Jirí Kylián; Dyad 1929 by Wayne McGregor; and The Concertby Jerome Robbins. He created the leading roles in Zodiac by Stanton Welch; Murmuration by Edwaard Liang; and Reveal by Garret Smith. He learned Latin dance and Hip-Hop dance in "Wuhan Sports Dancer Art School". 2004 "China Open Sports Dancing Competition" awarded top 10. He was the dance instructor during 2005 in "Wuhan Naval Engineering University" at the same time was teaching and choreographing as a dance instructor in 5 different gyms. After he moved to the U.S, he studied Contemporary dance and Jazz in "Western Illinois University". 2017 his dance was awarded top 10 and selected in the Final Gala of ACDC (American College Dancing Association). Karina González was trained at the Gustavo Franklin Ballet School in Caracas, Venezuela and has danced professionally with Ballet National of Caracas and Tulsa Ballet, where she reached the rank of principal in 2007. Ms. Gonzalez joined Houston Ballet as a soloist in 2010, and was promoted to principal dancer in 2013 following her performance as Nikiya in Stanton Welch’s La Bayadere. She has danced principal roles by the world's foremost choreographers, including Ben Stevenson's Cinderella, Dracula, Romeo and Juliet, and The Sleeping Beauty. She has won many awards during numerous competitions, a silver medal winner of the New York International Ballet Competition in 2007. Ms. González performed in the International Ballet Gala in Malaysia and was invited as a guest artist with Michele Wiles and Charles Askegard's up and coming company Ballet Next at the Joyce Theater in NYC. Ms. González has been featured on the cover of Pointe Magazine's February/March 2008 issue, Dance Magazine's November 2011 edition and A+C Houston Magazine’s November 2011 edition. Mr. Edwards, a native Jamaican, performed with Hartford Ballet, American Repertory Ballet, Boston Ballet and Tulsa Ballet where he was promoted to Demi-Soloist. Stevenson’s The Nutcracker, Dracula and The Sleeping Beauty; Anna-Marie Holmes’ Don Quixote; Rudy Vandasic’s Romeo & Juliet; George Balanchine’s Prodigal Son; Graham Lustig’s Cinderella, and many other classical and contemporary works. Mr. Edwards was also created on in the world premiere of Edward Liang’s Murmuration in 2013, this year’s best winner for the Best Ballet. class, he always explains the correct movements and applies appropriate muscles to improve techniques as ballet sometimes might change body structures and could develop bad habits if the movements are not trained correctly. Mr. Edwards also perform as a guest artist both local and nationally. MICHELLE COOMER was born in Southern California. She started dancing at the age of 3. She trained in jazz, ballet, lyrical, contemporary, and gymnastics. She enjoyed performing and competing in many dance competitions. In 1998, she won the title of Junior Miss Dance of Southern California at the Dance Masters of American Competition for her classical ballet technique. Soon after, she attended the summer programs of The School of American Ballet, Pacific Northwest Ballet, and The Houston Ballet Academy. At the age of sixteen, Michelle was asked to join the Houston Ballet Academy’s prestigious year-round training program on full scholarship and stipend. During that time, Michelle represented the Houston Ballet Academy in The USA International Ballet Competition in Jackson, Mississippi. There she was a finalist and received the Heinz-Bosl Foundation Scholarship award. In 2002, Michelle joined the Houston Ballet. In 2007, she was promoted to Demi-Soloist. Some of her classical and contemporary repertoire includes: Frederick Ashton's La Fille Mal Gardee, Mark Morris's Sandpaper Ballet; James Kudelka'sFirebird: Jiří Kylián's Forgotten Land and Falling Angels; Christopher Wheeldon's Carnival of the Animals, Rush, and Carousel; Trey McIntyre’s Peter Pan, Hans van Manen's Five Tangos; Sir Kenneth MacMillan's Manon and Gloria; Jerome Robbins' The Concert; Twayla Tharps' In the Upper Room, William Forsythe’s In The Middle Somewhat Elevated, Harald Lander’s Etudes, George Balanchine's Serenade, Four Temperaments, Western Symphony, Serenade, Jewels, Apollo, Symphony In C, and Theme and Variations; Ben Stevenson's Don Quixote, Cinderella, Dracula, Coppélia, Nutcracker, Swan Lake, Romeo and Juliet, and The Sleeping Beauty; Stanton Welch's Swan Lake, Divergence, Indigo, Play, Velocity, Tu Tu, Madame Butterfly, Red Earth, Four Seasons, Cinderella, Falling, Doll's House, Marie, and La Bayadère. She performed many principal roles including the Snow Queen in The Nutcracker and Gamzatti in Stanton Welch’s La Bayadere. After 9 years of dancing with the Houston Ballet, Michelle retired to focus on starting her family. She and her husband, Houston Ballet Soloist Christopher Coomer, have 3 beautiful children. For the past several years she has taught around the Pearland and Houston Area. Michelle is thrilled to be able to share her knowledge and love for dance to young dancers in the area. CHRISTOPHER COOMER was born in Birkenhead, England, and received his training at Wallasey School of Ballet and Houston Ballet's Ben Stevenson Academy. He joined Houston Ballet in 2004 and was promoted to soloist in 2007 following his performance in Stanton Welch's Clear. Chris is currently in is 14th season with the Houston Ballet. Chris' classical and contemporary repertoire works include: Giselle, Onegin, The Nutcracker, Merry Widow; Christopher Bruce's Rooster, Hush, Sergeant Early's Dream, and Swan Song; Mark Morris's Sandpaper and Drink to Me Only With Thine Eyes; James Kudelka's Firebird and Little Dancer; Jiří Kylián's Petite Mort, Forgotten Land, and Svadebka; Twyla Tharp's The Brahms-Haydn Variations; Christopher Wheeldon's Carnival of the Animals; Hans van Manen's Five Tangos; Julia Adam's Ketubah, Sir Kenneth MacMillan's Gloria; Jerome Robbins' The Concert; George Balanchine's Western Symphony, Serenade, Jewels, and Theme and Variations; Ben Stevenson's Don Quixote, Dracula, Coppélia, and The Sleeping Beauty; Stanton Welch's Manninyas, Divergence, Indigo, Play, Velocity, Elements, Tu Tu, Madame Butterfly, Red Earth, Clear, Four Seasons, Cinderella, Falling, Doll's House, Marie, and La Bayadère. In addition, Chris has performed featured roles in many works, including: George Balanchine's Jewels; Stanton Welch's Tu Tu, Red Earth, Cinderella, and La Bayadére; Paris and Tybalt in Ben Stevenson's Romeo and Juliet; Von Rothbart in Stanton Welch's Swan Lake; Edwaard Liang's Murmuration, Gurn in August Bournonville's La Sylphide; Sharpless, Prince Yamadori, Bonze, and Pinkerton in Stanton Welch's Madame Butterfly. Since 2017, Chris taught the Houston Ballet Academy and Company auditions, and he has been asked to set choreography on other professional dance companies around the world. During the summer of 2018, he taught at the Houston Ballet Academy’s very first satellite intensive in San Antonio.